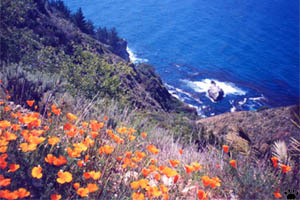 Few parts of our planet are as beautiful as Alta California (the part of historic California now belonging to the USA). It is one of the places that any naturalist should try to visit in his lifetime. Unfortunately, for citizens of some countries it is almost inaccessible because of creative visa policy. Other areas from a naturalist's "must see" list, such as Outer Mongolia, selva of Upper Amazon, and Subantarctic islands, are more easy to get to. Having been born on vast, cold, boring post-glacial plain of European Russia, I probably enjoyed living in Northern California much more than locals do. It's so nice to have rainforests, taiga, alpine meadows, Mediterranean grasslands, oak savannas, sage steppes, and hot deserts within a weekend trip distance! 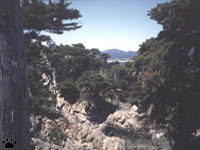 macrocarpa), Point Lobos State Park. Besides, some of the World's most productive waters are just offshore, teeming with whales and other marine mammals, as well as hundreds of fish species and unfathomable diversity of invertebrates. Ch. hysoscella. Monterey Bay Aquarium. Underwater wonders of Californian coast are beyond the scope of this page - you can find some beautiful photos here. Cyanea lamarkii. Monterey Bay Aquarium. Raccoon tracks on a beach, Lost Coast. columba), Carmel Bay. 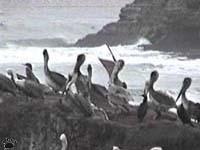 Seabirds from as far as Chukotka, North Atlantic, Australia and Antarctica show up in Californian waters, some in flocks of millions. Black-footed albatross (Diomedea nigripes), Monterey Bay. 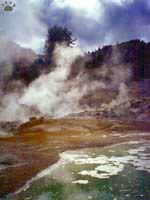 Volcanic Tableland. Natural bounty of California has always attracted people. Before the European arrival, more than 200 languages had been spoken here; many of them isolated and apparently very old. Some of the oldest archaeological sites in the New World are also in California. Ohlone shellmounds around San Francisco Bay are the result of more than 3,000 years of uninterrupted accumulation of human-produced sediment - the oldest lifespan for a single culture in the history of humanity. Formerly hunters-gatherers, native Californians are now mostly casino owners or tourist business operators. columbianus, Eureka. My favorite place in California is Redwood National Park in the northwest. I think it is the World's most beautiful forest. Redwood trees more than 110 m (330') tall grow here together with many smaller, but also interesting plants and fungae. Usually wrapped in picturesque, semi-transparent fog, groves of giant redwoods look absolutely majestic. Patrick's Point. Many wonderful animals inhabit these forests, but they are usually difficult to see, except for deer, birds, chipmunks, millipedes and giant banana slugs. Some local species, such as tailed frogs, Grylloblattidae insects, or redwoods themselves, are "living fossils", relicts from Tertiary period, or even more ancient times. World's most primitive rodent also lives here - I devoted a special page to it. Lungless salamanders of Northern California, left to right: Ensatina eschscholtzii platensis, E. e. oregonensis, Aneides lugubris, Batrachoseps attenuatus, Hydromantes brunus. rainy winters. Hastings Reservation. Salamanders of California are particularly interesting. There are about 30 or 40 species here (the number keeps growing, as more research is done on their genetics), ranging in size from tiny slender salamanders (Batrachoceps) to 7'/20 cm-long Pacific giant salamanders (Dicamptodon). 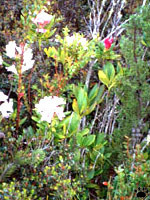 Most are found in wet coastal forests, but some inhabit desert oases or mountains above timberline. Only a few species are common and widespread, so seeing all of them requires a lot of time and effort. You have to look under thousands of rocks and rotten logs. 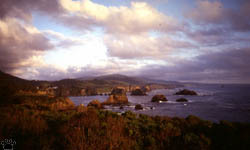 the Pacific Coast. Redwood N. P.
Redwood National Park. There are relatively few large mammals in Northern California, but you still get to see some interesting interactions. parking lot, Santa Cruz Mountains. Roosevelt elk (Cervus canadensis roosevelti) chasing mule deer (don't ask me why). Prarie Creek Redwoods State Park. Pygmy Forest, Van Damme Park. 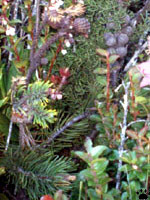 Not far from the world's largest conifers, you can see the world's smallest ones. 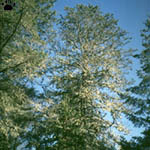 In Pygmy Forests of Mendosino White Plains, there are 200-year old trees less than 1' (30 cm) tall. These natural bonsai-like forms of lodgepole pine (Pinus contorta bolanderi) and Gowen cypress (Cypressus goveniana pigmaea) are created by poor soil conditions. 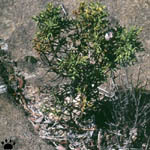 Some insects, mites and plants, such as manzanita Arctostaphylos nummularia, do not live outside Californian pygmy forests. 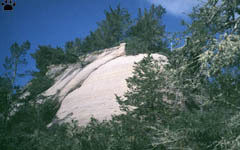 Santa Cruz Cypress (Cupressus goveniana abramsiana) grows only on sandstown outcrops in Central California, sometimes as a bonsai (right photo). Boonie Doon. Point Reyes. 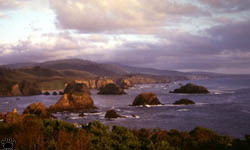 Shoreline between Oregon border in the north and Los Angeles in the south is ragged and mostly rocky. In winter, it is often hidden in dense fog. Coast south from Big Sur, Point Arena area, Lost Coast and the part from Point Reyes to Golden Gate Bridge are the most beautiful stretches. View of Golden Gate Bridge distorted by refraction. 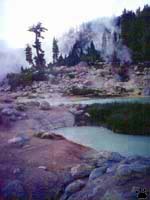 Northeastern California is the world of volcanoes, lakes, lava plains and dry pine forests. peregrinus), and a nice place for rock climbing. habitat of 3 endangered fishes. rare species of sculpins (Cottus). As any other part of California, it has its share of rare flora and fauna. have white or pink flowers. 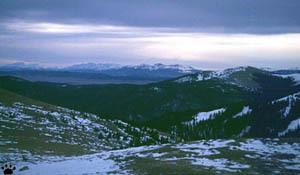 Ishi Wilderness. 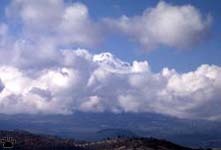 Views from the summit of Mount Shasta. 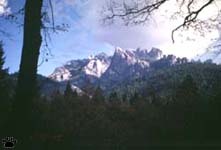 November in Warner Mountains, California.